A clear strategic focus and sound management are essential to the effective stewardship of taxpayer dollars, enabling agency decision makers to make tough choices on a day-to-day basis and for long-term management challenges. Given the critical challenges facing government today, the ability of government executives to properly align mission support functions with mission delivery can help them respond more effectively to their mission and management challenges simultaneously, as well as drive change within their department. The U.S. Department of Commerce has sought to improve performance and operations while managing its resources more efficiently and effectively. What is the management and performance agenda for the US Department of Commerce? How is commerce working to transform the way it does business? And what is commerce doing to support its employees and reform its hiring process? 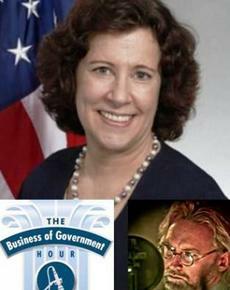 Ellen Herbst, chief financial officer and assistant secretary of Administration within the US Department of Commerce joined me on The Business of Government Hour to discuss these questions and more. Here’s a highlight of our exchange. On the Mission of the U.S. Department of Commerce “The U.S. Department of Commerce was established in 1903,” notes Ellen Herbst, chief financial officer and assistant secretary of Administration, but it was actually called the Department of Commerce and Labor.” Within ten years, that changed and the U.S. Department of Labor was established, taking over the labor-related activities. From then on, the mission of the Commerce has focused on creating the conditions for economic growth and opportunity. According to Herbst, Commerce has one of the most diverse mission sets of any cabinet-level agency. “I realize many cabinet agency leaders say that, but just look at the department’s portfolio. Our department has everything from predicting the weather to counting people in the decennial census to issuing patents and trademarks, to helping businesses trade, increasing exports, and enhancing regional economic development.” It meets these varying missions with 12 operating units, about 47,000 employees, and a budget of some $8.5 billion. On the Key Strategic Priorities of Commerce Soon after joining the Department of Commerce, Secretary Prizker embarked on a nationwide listening tour to hear from the department’s customers and stakeholders. “She gathered the best ideas for how we can all work together to set the conditions for more and faster economic growth and job creation,” declares Herbst. Crafted based on inputs from hundreds of CEOs, entrepreneurs, employees, and others across the country, Commerce’s released its Strategic Plan for Fiscal Years 2014 to 2018. This plan, according to Herbst, provides a broad foundation for economic growth and opportunity by focusing on five key priorities: Trade and Investment -- expand the U.S. economy through increased exports and inward foreign investment that lead to more and better American jobs Innovation – foster a more innovative U.S. economy—one that is better at inventing, improving, and commercializing products and technologies that lead to higher productivity and competitiveness Data -- improve government, business, and community decisions and knowledge by transforming Department data capabilities and supporting a data-enabled economy Environment -- ensure communities and businesses have the necessary information, products, and services to prepare for and prosper in a changing environment Operational Excellence -- deliver better services, solutions, and outcomes that benefit the American people The secretary’s outreach effort provided a wonderful opportunity to take that example in-house. “As part of our process,” describes Herbst, “we brought together the senior leadership of the entire department, including the COOs of our operating units, hosting many discussions and asking tough questions. It was an absolutely essential part of our success in developing the strategic plan.” Another other factor contributing to its success, according to Herbst, was having both the political leadership and senior career leaders together in the development of the strategic plan, monitoring process, implementation, and then executing on the strategic priorities. In the past, every operating unit developed their own strategic plan. They were brought together, and after the fact, common threads were identified and connected. “We then wrote a kind of topper piece. Having a secretary from the business community has been very helpful in bringing that kind of classic strategic planning approach to our department,” says Herbst. On Turning Challenges into Opportunities The department’s newly minted strategic planning process has also lead to the way it does its business. For instances, each key priority has a goal leader. Pursing intra-agency goals -- “The goal leader for the environment priority” explains Herbst, “is the NOAA administrator, who is responsibility now cuts across all of the operating units that have a piece of one of the objectives in the environmental pillar.” This wasn’t the previous normal operating process and for that reason it is as much as an opportunity as it is a challenge, Limited budget resources – “Budget constraints are with us today. One of our challenges and opportunities is to figure out ways to both deliver better service, but do it in a more economically sustainable way. Mission support activities such as financial management, human resources, and procurement enable programs to meet their respective missions. I believe the only reason to do them is in support of the mission.” According to Herbst to turn challenges into opportunities, the department is banking on the implementation of shared services for a host of mission support functions. “We're putting our efforts into delivering improved quality and consistency of service delivery, improved transparency and accountability to clients, but most of all doing it in a way that's going to be economically viable over the longer term.” On Pursuing Shared Services The Department of Commerce has established four working groups targeting opportunities to implement shared services within technology, finance, human resources, and acquisition. According the Herbst, the purpose is to identify capabilities that could be best delivered by a shared service provider. “The goals of our shared service initiative focus on improving service delivery as well as improved accountability and transparency. Our ultimate purpose is to get more bang for the buck in terms of better and faster service,” Herbst said. Commerce is analyzing approaches to shared services to help lower administrative costs and put more money toward mission and program activities. The department may stand up an internal organization that will be responsible for selecting and managing providers, service agreements, and performance. “If you do shared services right,” underscores Herbst, “you will get at minimum cost avoidance; you will likely get cost savings, but that's not the only reason to do it. The reason to do it is to make sure that we can continue to deliver excellent mission support to programs.” A finer point couldn’t be made in an environment where resources continue to be constrained.”I'm probably most passionate about what we're doing right now. Our departmental motivations are truly about improving services.” On Role & Responsibilities Some federal departments have administration and the finance under the same portfolio, some don't -- Commerce does. “My portfolio includes financial management, budget, human resources, acquisition, civil rights, open government, facilities, risk management, and performance management. It's a pretty broad portfolio,” Herbst explains. She has over 300 federal employees in her office plus a large number of contract support people. “I'm the luckiest federal CFO ,” declares Herbst, “because I have the best team in government. I have great leaders running each function under my portfolio, and just an overall, uniformly excellent workforce.” On Leadership Leading that workforce takes certain kinds of qualities: “My leadership style continues to evolve I started managing people when I was 23 years old. I strive to be a true servant leader. Spend the time picking excellent people and put them in the right place to excel. If you do that, then your job becomes essential guidance, support, brainstorming, and problem solving with staff. I'm not a command and control person by personality or by leadership style. I am a data driven, outcomes oriented person. You need to be very clear about the goals you're trying to achieve, plan accordingly, measure the milestones, and track the progress. This is the only way you can achieve shared expectations. How do you know that you've achieved success in something if you don't talk upfront and agree on what success looks like and how you're going to measure it I also spend a lot of my time talking to my department and bureau peers about how we're doing. As a one of the department leaders, I see myself as a business partner to the mission areas helping them problem solve and ensure that the services we deliver are aligned to their mission outcomes.” I invite you to listen and/or download my complete interview with Ellen Herbst on The Business of Government Hour.